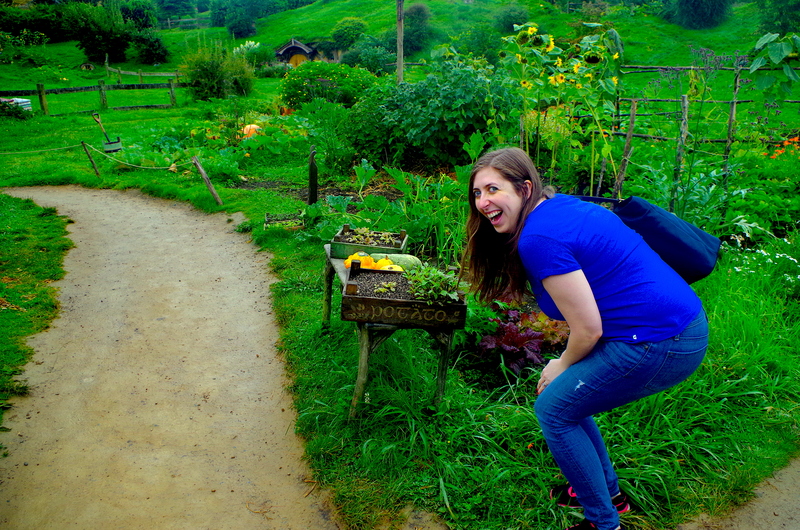 One of the highlights of our trip to Middle Earth (I mean New Zealand) was definitely our tour of Hobbiton. 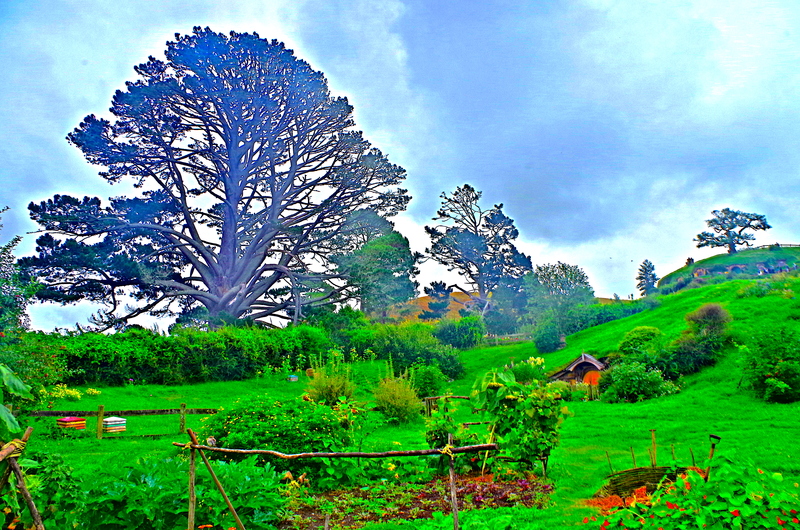 If you’re reading this, then it’s pretty likely that you already know that when Peter Jackson rebuilt the the Shire for The Hobbit films, it was done in a way that was intended to be permanent. 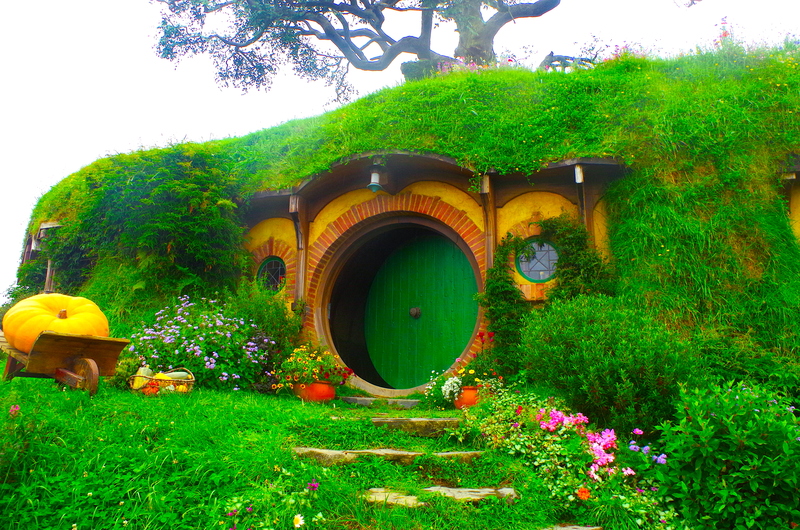 If you are a fan of the Lord of the Rings – even if you only read the books – this is really a must visit, assuming of course, that you find yourself in New Zealand. First of all, the Hobbiton location is very easy to get to. Unlike some of the other places we visited, you don’t need to be an adventurer to get here. Located right outside Matamata on the North Island, you can get easy lodging and transportation to the location. In fact, tickets include a bus ride from the center of town straight to the set. Matamata itself is a charming little town worth making a base of operations to explore from. Here’s a quick spoiler alert – this review is going to be glowing. 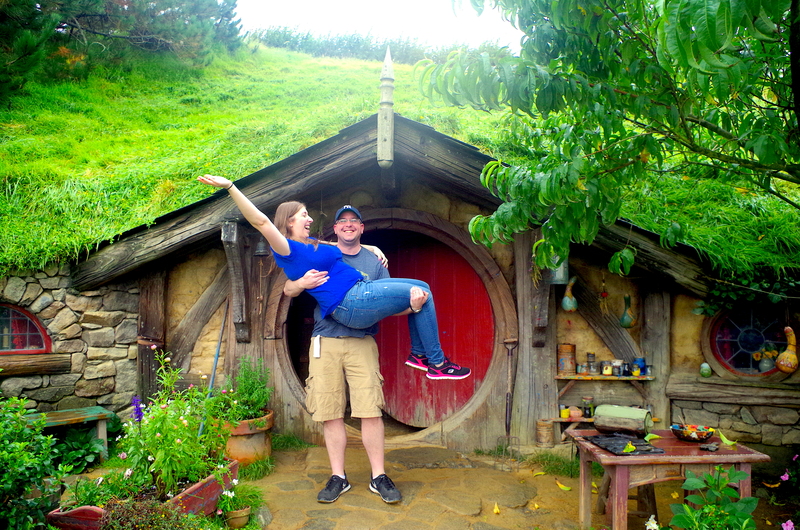 Our experience at Hobbiton was awesome. So I’ll just get the (very minor) nitpicks out of the way up front. First easy access means big crowds. This isn’t like ” rel=”noopener” target=”_blank”>finding Edoras or traipsing through Rohan – you will not be alone here, at all. For most people this isn’t a problem. But it does make it harder to really immerse yourself in the experience when people are bothering you to take pictures of them or crowding into your own pictures. Thing is…you’re probably going to be doing the same thing. So stop complaining. Bag End from a distance. Note the people in the picture, grumble grumble. The second issue with Hobbiton is that it’s preeeetttttty expensive. The most affordable option is $79 per person. Now this includes transportation from Matamata and a free drink at the Green Dragon Inn (yes it’s a real place). And the experience is SO worth it. But $79 is a lot of money and if you’re on a really tight budget, that could be a couple days-worth of expenses. There are lots of epic places in New Zealand that cost a lot less or are free. But none of them are Hobbiton. It’s BAG END. Like in real life! Although there’s sadly nothing inside since they filmed all those scenes in a studio. Finally, being that it’s a guided tour that means you can’t really operate at your own pace. They certainly don’t rush you, but if they would have given us 10 more minutes we wouldn’t have complained. Hell, if they had given us 10 more hours we wouldn’t have complained either. 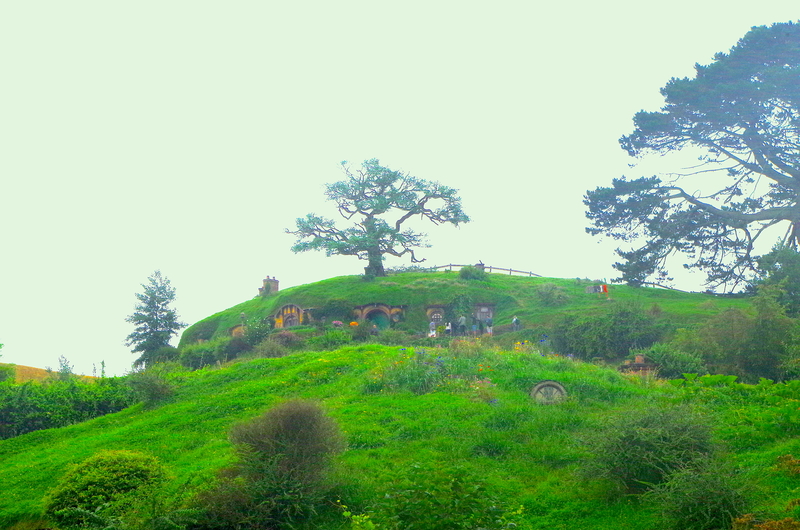 Ok, so now that we got the criticisms out of the way, let’s talk about how awesome Hobbiton is. No admittance except on party business. Let’s start with that fact that it’s huge. 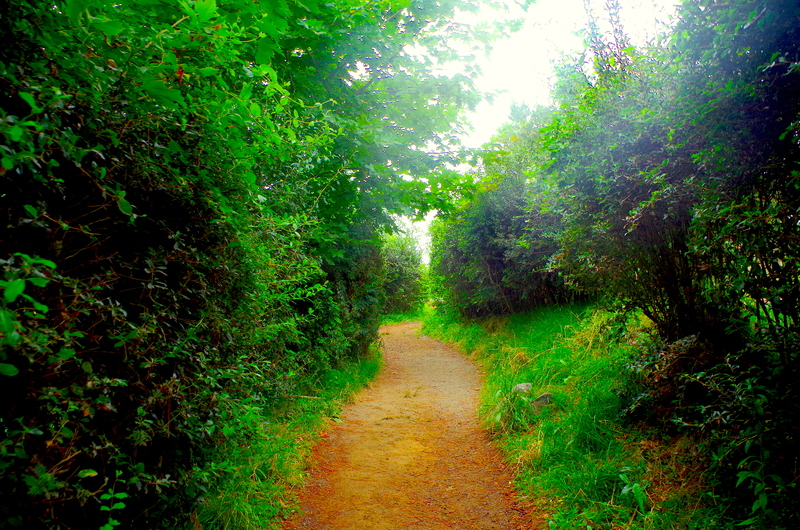 Everything you see in the movies is actually a place you can walk through. Nearly every prop they used in the film is actually a thing that you can interact with. Really, that’s the most striking thing about the place. It’s incredible how REAL everything is. The mill and the bridge that Gandalf crosses in the first film. Unlike Lord of the Rings, the vast majority of what you see in The Hobbit films is CGI. Even the outdoor scenes were mostly filmed indoors (a crime in my opinion) with green screens simulating the scenery you see when you’re actually in New Zealand. But either for nostalgic reasons or to recreate the same look and feel of the original films, Jackson literally built over a hundred Hobbit holes and then surrounded them with farms, streets, paths, bridges, gardens and buildings. A wizard is never late, Frodo Baggins. Nor is he early. He arrives precisely when he means to! The level of detail is literally unreal. Want to recreate Gandalf’s entrance from the first film? You got it. Pretend you’re Samwise Gamgee and peak in through the windows of Bag End? Why not. 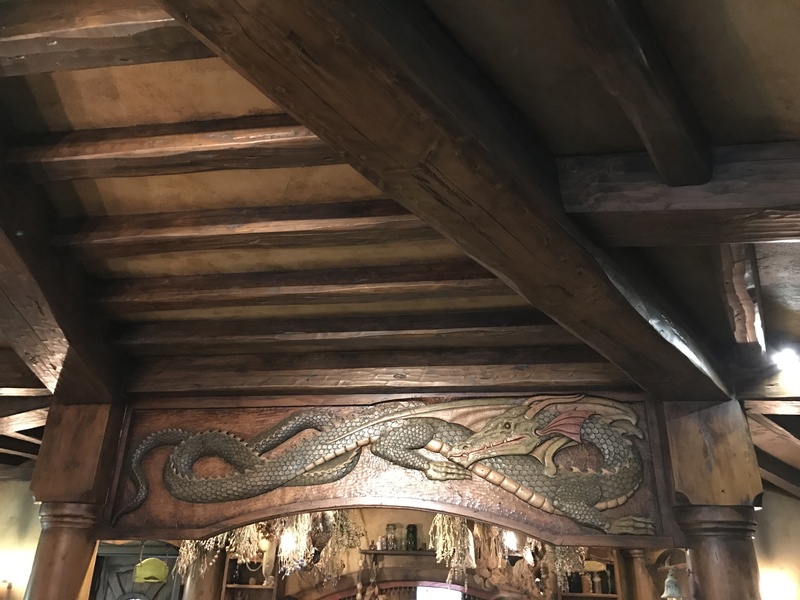 Sing along with Merry and Pippin at the Green Dragon? Absolutely. Burst out running all the way across the Shire like Bilbo? Well, you COULD do that I guess, but I wouldn’t recommend it since it really is a hill and you’ll probably break your leg. The Party Tree where Bilbo celebrated his eleventy first birthday. But the really surprising thing to me was how much they have that is NOT in any of the films, or only makes an appearance for a few seconds. In a way, going to this place is like the ultimate extended edition. Just a random hobbit hole. It was really fun to see all these little spots that weren’t even really in the films. See they built this place to look and feel like a fully functional little Hobbit town. But outside of a few shots in the films, it’s highly likely that you have never seen the vast majority of what they built. 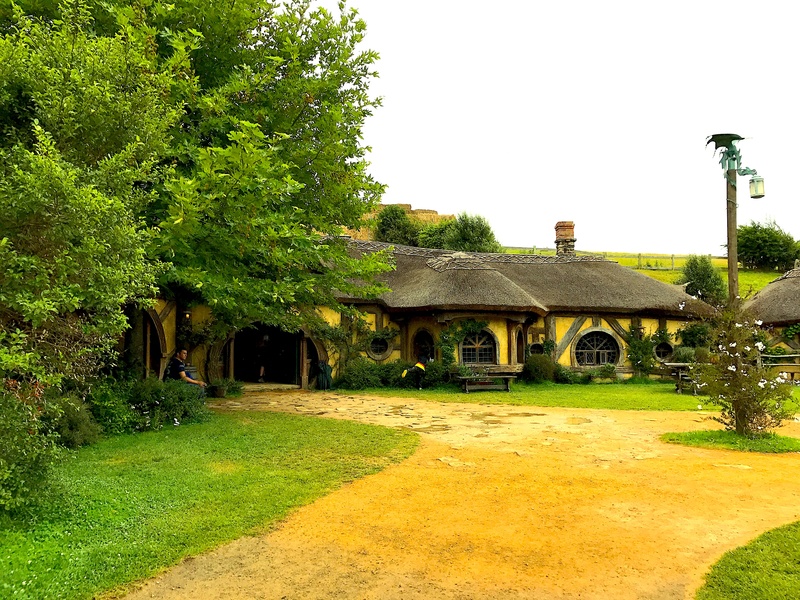 In that way, Hobbiton is more like a theme park than a movie set. Boil ’em, mash ’em, stick ’em in a stew. Nowhere is this more true than at the Green Dragon Inn. The bar, which is actually one of the busiest pubs in the entire country, is not just what you see in the films, it’s actually a really cool place to have a drink. They have a full service bar, but the main attractions are a few Tolkien-themed beers. They’re pretty light on the alcohol, but they could definitely pass in a conventional bar and they taste really good too! And here’s a pro tip – if you’re only going to have one, go with the cider. Finally there’s something that’s just a little charming about clinking a cold glass of Southfarthing Ale, while maybe, possibly, singing the Green Dragon song next to a toasty fireplace. There’s also an option for a dinner at the Green Dragon along with an evening tour. That…would have been awesome, but we couldn’t do it because it’s only available on a few nights per week and it didn’t align with our itinerary – so definitely check before and try to plan around if that’s something you’re interested in. It’s a great way to cap a trip to a truly magical place. 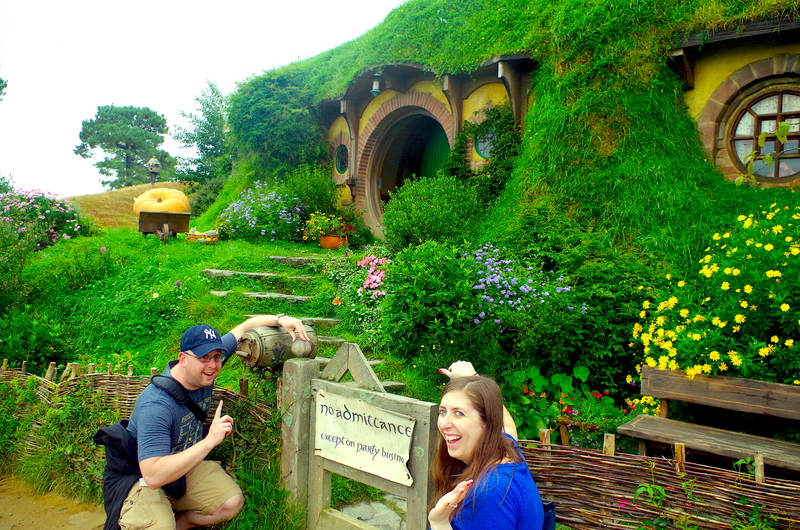 Our trip to Hobbiton was definitely one of the highlights of our trip. 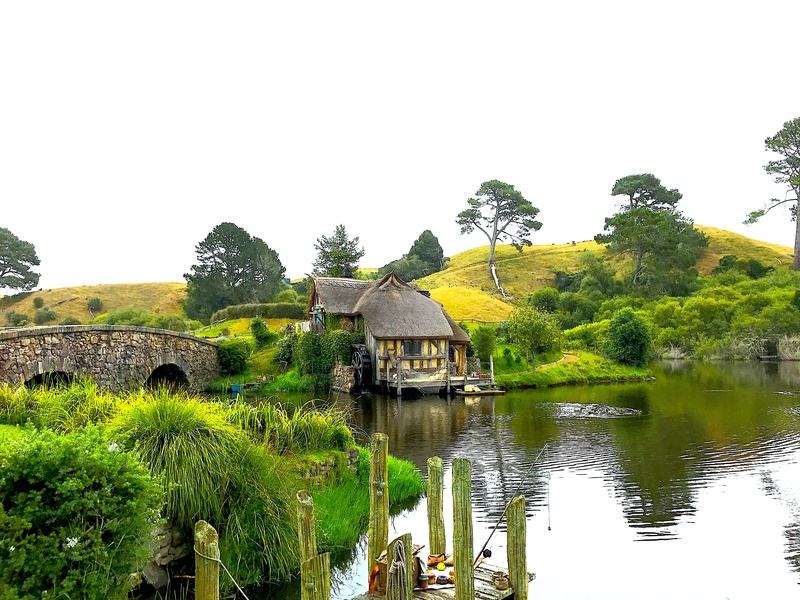 While it wasn’t as epic of an experience as some of the truly astonishing places we visited, Hobbiton was so much more than just a movie set. 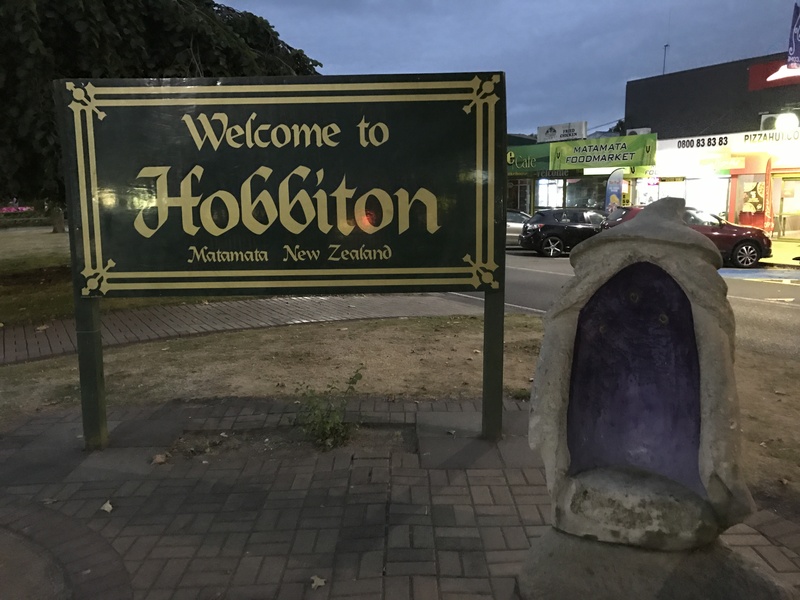 And with how easily accessibly it is, if you’re in New Zealand – even if you aren’t a huge Tolkien nerd – you really need to go here. PS this is not to be confused with the Hobbiton in California. In an odd coincidence I’m pretty sure I drove right by it on my solo cross country journey but didn’t see it because it was dark and I was coming off one of the most miserable days of the trip.